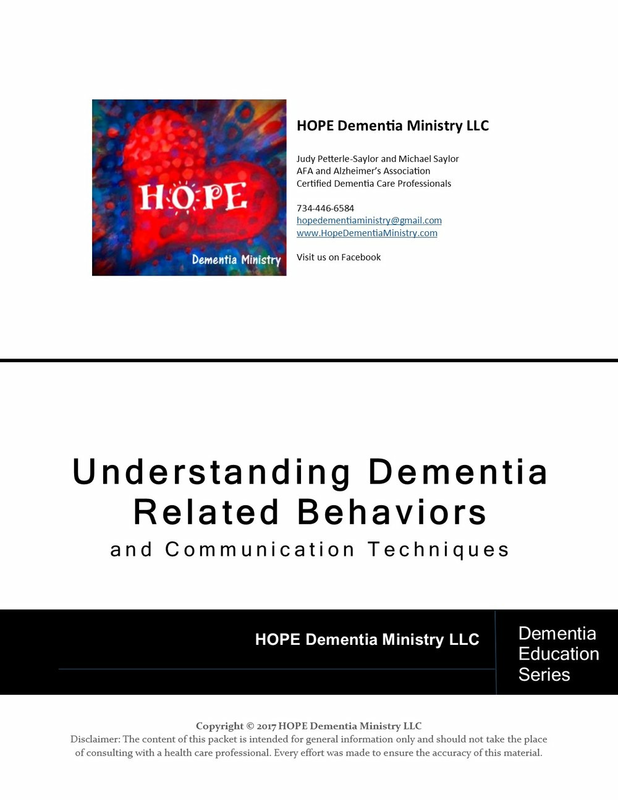 HOPE Dementia Ministry is an organization that facilitates educational workshops for caregivers and family members of those with dementia. We are dedicated to empowering husbands and wives, sons and daughters, brothers and sisters, and all caregivers, with the knowledge and skills needed to create a positive journey for themselves and the person they are caring for. Your help will bring knowledge and comfort to families, by allowing us to offer these free seminars to families much like your own. We thank you for your consideration. Why we do what we do... Care giving is a very difficult job that brings with it a great deal of stress. Many people feel they have to go it alone, but statistics are showing that this option has devastating results. Shockingly, a large percentage of all caregivers die before the person they are caring for, and roughly 40% of all caregivers suffer from a moderate to high level of depression. This stems from the caregiver focusing all of their attention and energy on the person they are caring for, while neglecting themselves. The troubling part is it doesn't need to be this way. Our educational sessions and material help people learn how to be healthy caregivers by utilizing a team approach to care giving, and by exploring the variety of services that are available to help the caregiver, and educating yourself on the different aspects of dementia. Our educational booklets are available to download and cover a variety of topics. All proceeds go to supporting continued education and allow us to offer our events free to the public.